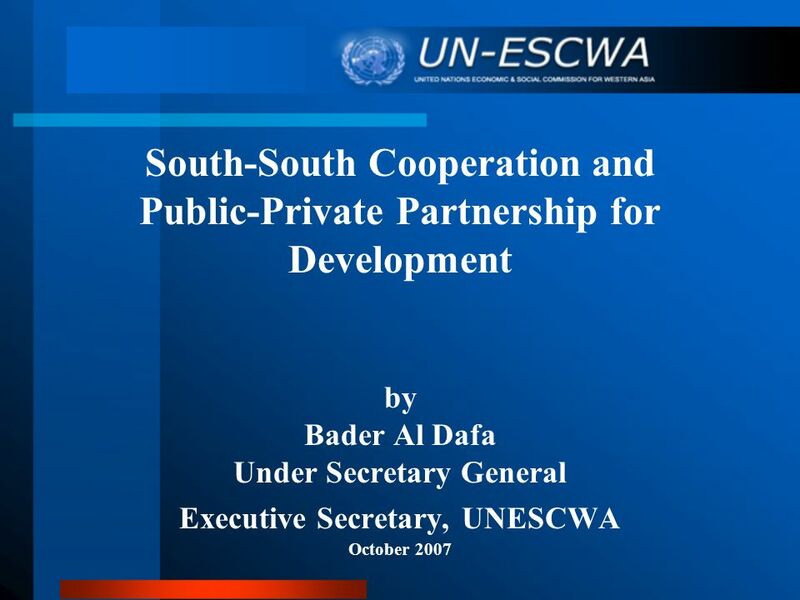 South-South Cooperation and Public-Private Partnership for Development by Bader Al Dafa Under Secretary General Executive Secretary, UNESCWA October 2007. 3 1. 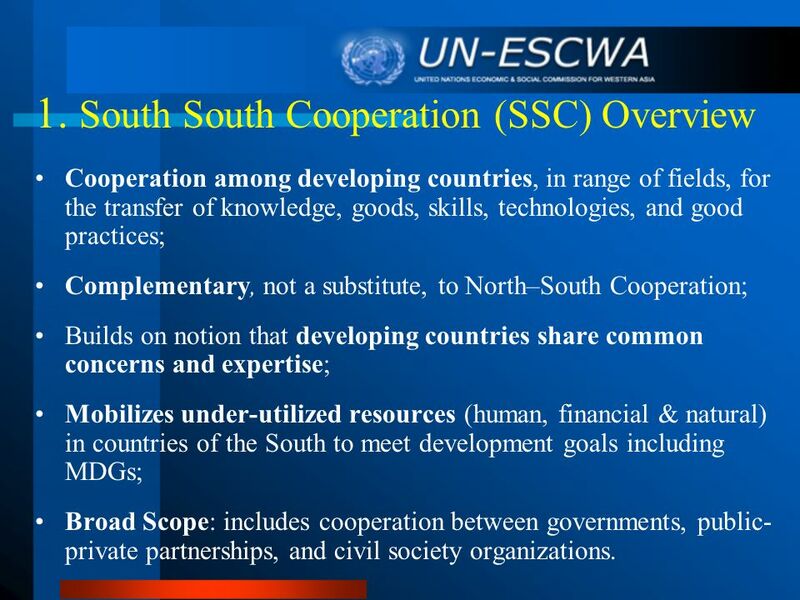 South South Cooperation (SSC) Overview Cooperation among developing countries, in range of fields, for the transfer of knowledge, goods, skills, technologies, and good practices; Complementary, not a substitute, to North–South Cooperation; Builds on notion that developing countries share common concerns and expertise; Mobilizes under-utilized resources (human, financial & natural) in countries of the South to meet development goals including MDGs; Broad Scope: includes cooperation between governments, public- private partnerships, and civil society organizations. 8 4A. 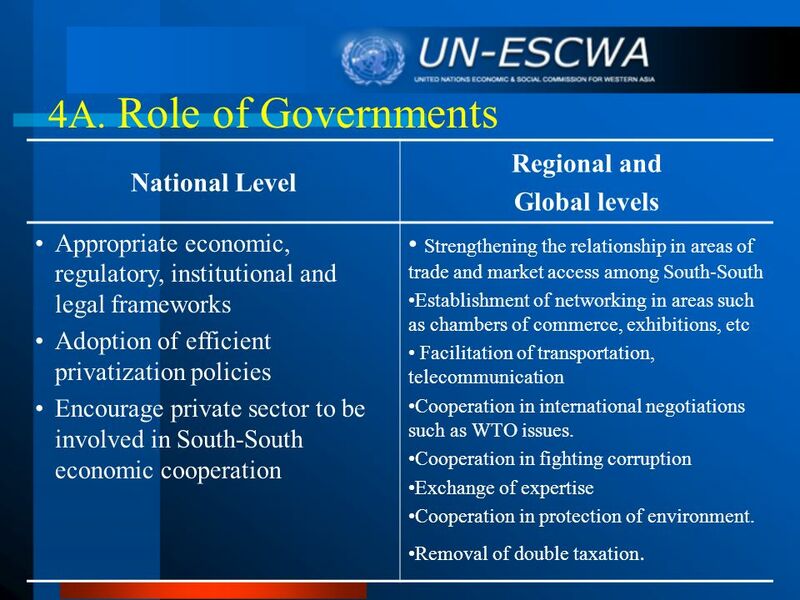 Role of Governments National Level Regional and Global levels Appropriate economic, regulatory, institutional and legal frameworks Adoption of efficient privatization policies Encourage private sector to be involved in South-South economic cooperation Strengthening the relationship in areas of trade and market access among South-South Establishment of networking in areas such as chambers of commerce, exhibitions, etc Facilitation of transportation, telecommunication Cooperation in international negotiations such as WTO issues. 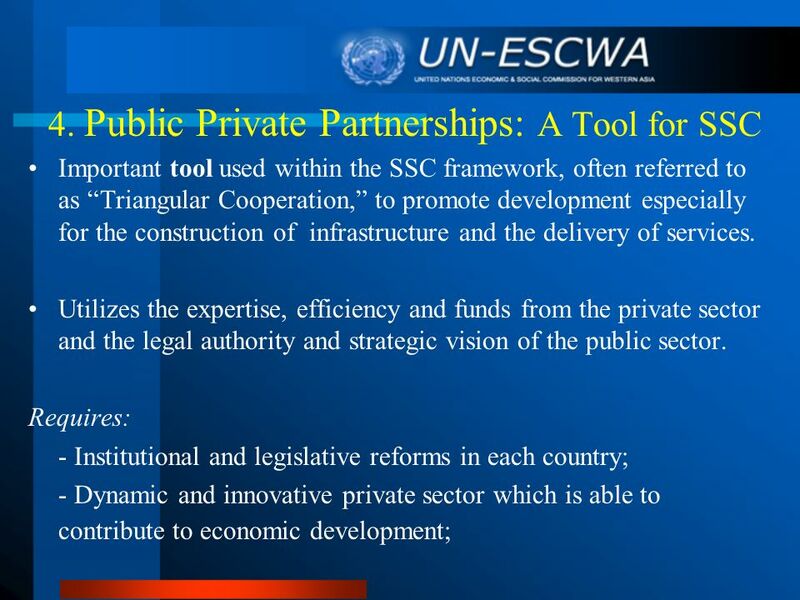 Cooperation in fighting corruption Exchange of expertise Cooperation in protection of environment. Removal of double taxation. 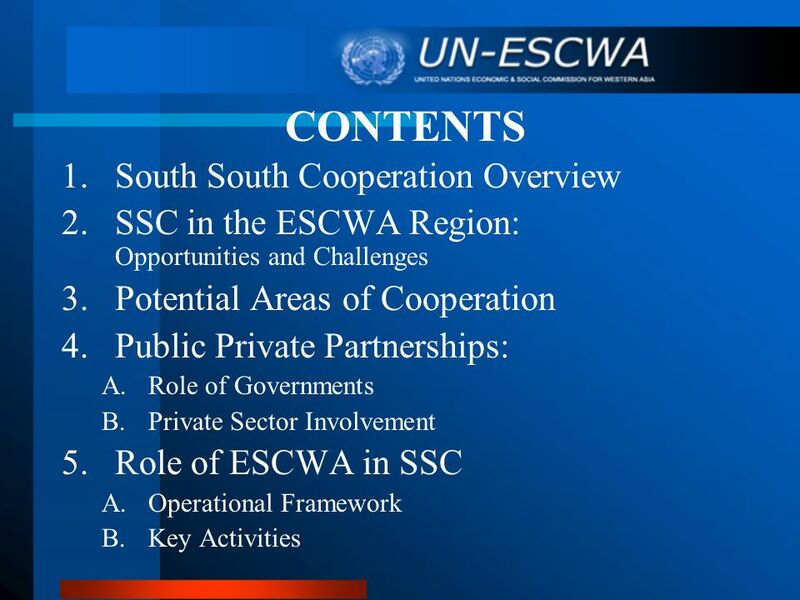 Download ppt "South-South Cooperation and Public-Private Partnership for Development by Bader Al Dafa Under Secretary General Executive Secretary, UNESCWA October 2007." 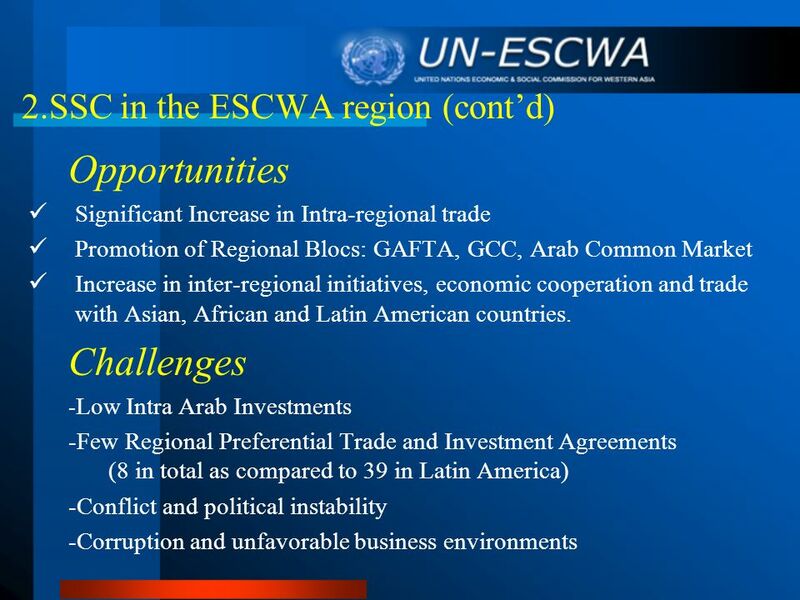 Regional Cooperation as a Catalyst for Development in a Changing Environment: ESCWA region Rima Khalaf Under-Secretary-General, Executive Secretary UNESCWA. 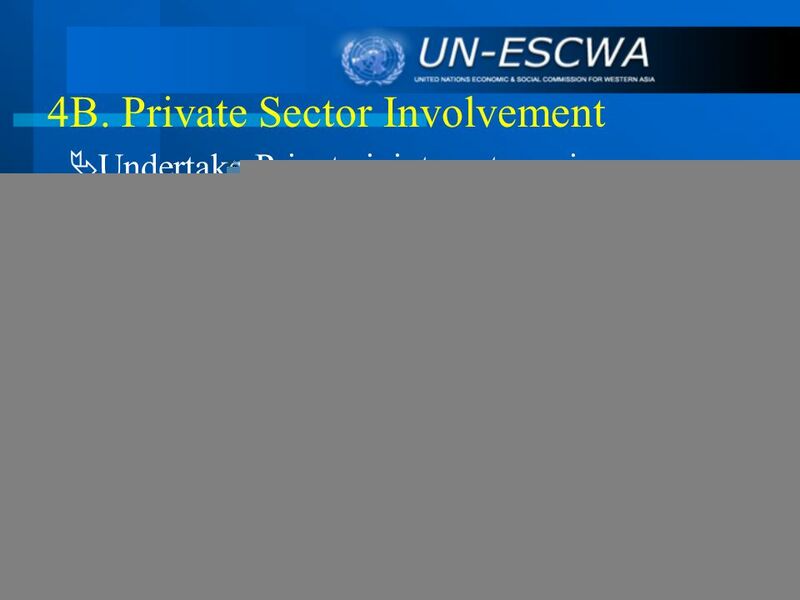 1 African Capital Markets and the Global Partnership for Development Abdoulie Janneh UN Under Secretary-General and Executive Secretary of ECA UN Regional. 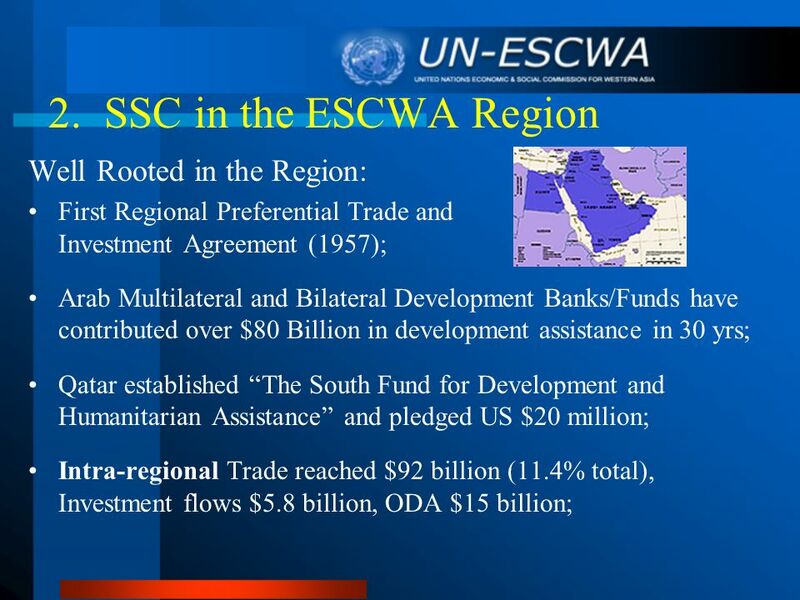 B y Bader Al-Dafa Under Secretary-General Executive Secretary UNCTAD XII, Ghana, 23 April 2008 Promoting Aid-for-Trade In the ESCWA Region Promoting Aid-for-Trade. Visit African Trade Policy Centre at Dialogue of the Executive Secretaries with the Second Committee October 2007 Abdoulie Janneh, ECA. 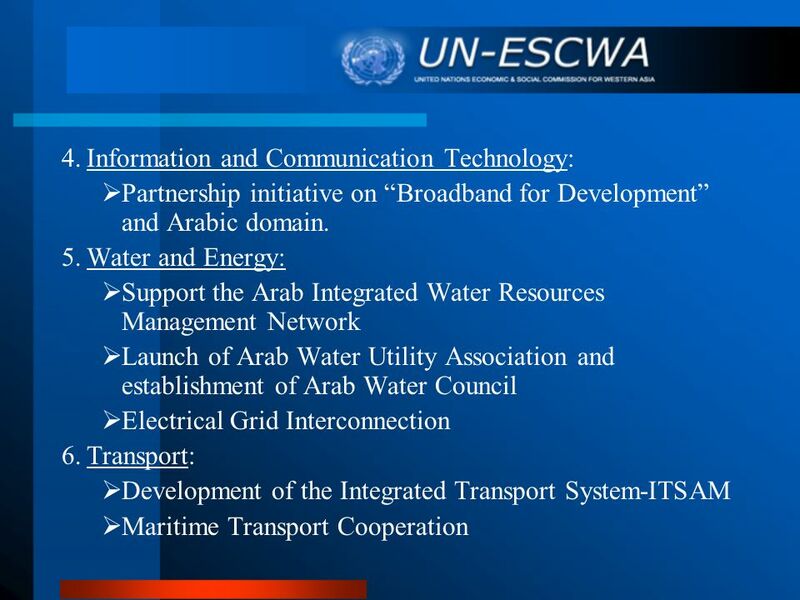 Energy for Sustainable Development in the ESCWA region Bader Al-Dafa Under Secretary-General and Executive Secretary July 2008 High-Level Dialogue of the. 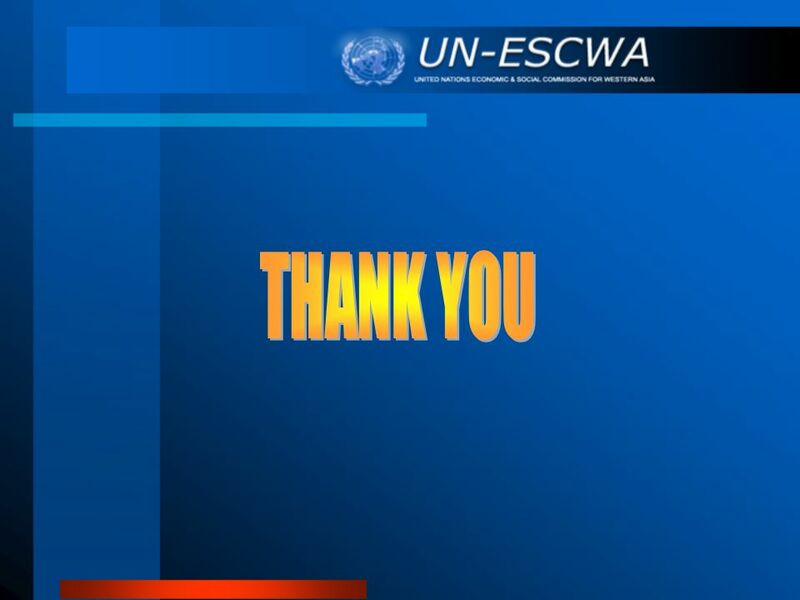 UN-OHRLLS International support measures and financial resources for LLDCs Gladys Mutangadura UN-OHRLLS. 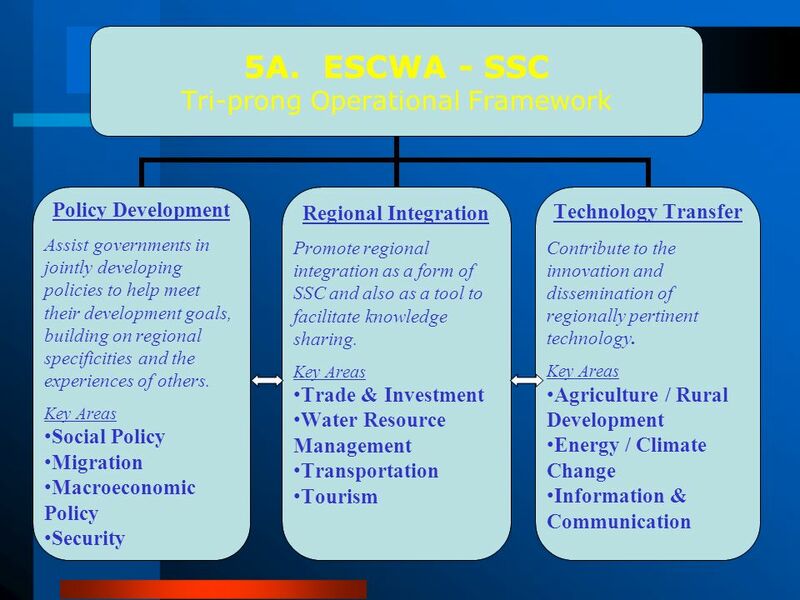 1 African ICT Roadmap to Achieve NEPAD Objectives Arusha, Tanzania, 1-3 April 2003 Roles of Government and ATU in the Implementation of NEPAD ICT objectives. 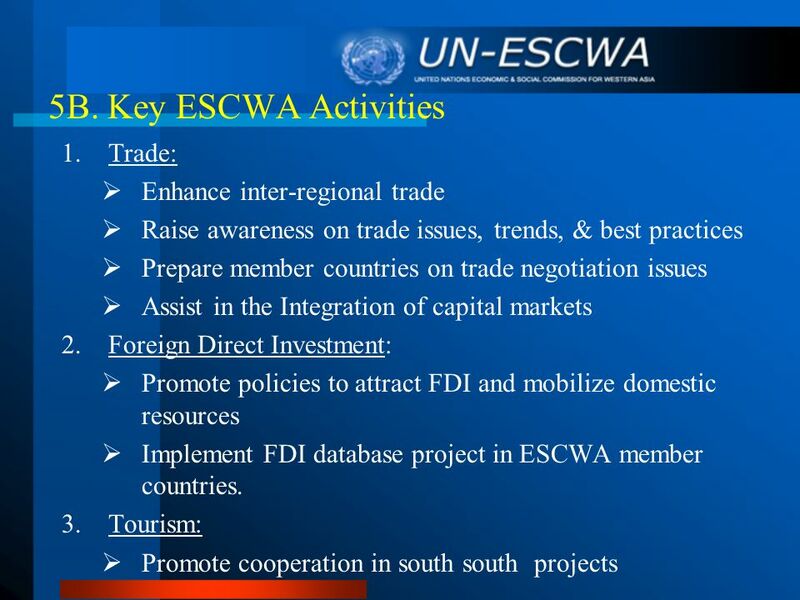 Overview of Regional Investment Promotion and Facilitation Schemes -Possible Applications in the SEE 10 th Meeting of the South East European Investment. 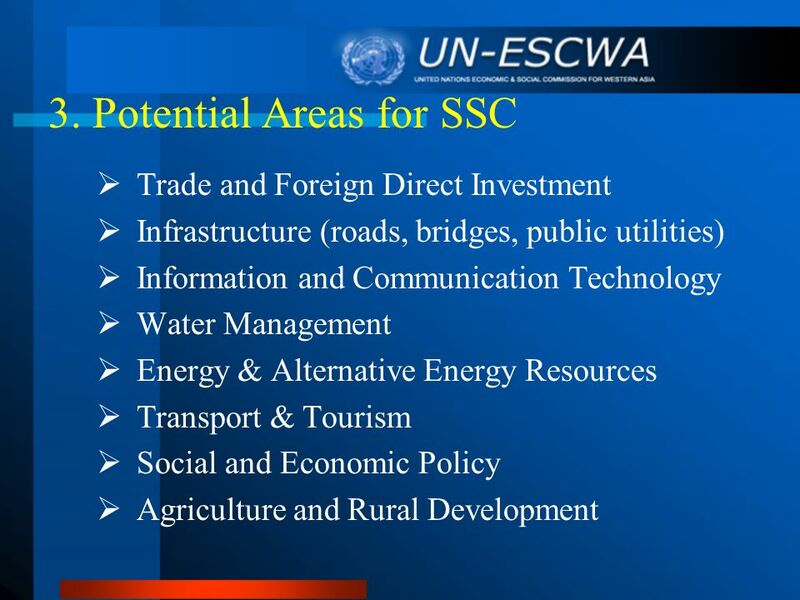 GAMBIA COMPETITION COMMISSION GAMBIA COMPETITION COMMISSION Levelling the Field for Development BY : EXECUTIVE SECRETARY 5 TH JUNE 2013. Cambodian Group Presentation Mekong Institute Khon Kaen, Thailand September, 2010. Workshop on “Establishing public private partnerships for ICT initiatives” Amman, 26 February - 1 March 2007 Workshop on “Establishing public private partnerships.